ALL YOU NEED to know about the Congressional Gold Medal is that the first honoree was George Washington. The list of recipients honored since for "distinguished achievements and contributions" reads like a Who's Who of modern history: Ulysses S. Grant, Thomas Edison, Charles Lindbergh, Winston Churchill, Jackie Robinson, Martin Luther King Jr., Pope John Paul II ... well, you get the idea. And then there's the small, soft-spoken, 86-year-old woman who answered the door of her Berkeley residence the other day. Maybe you don't know about Maggie Gee. "You would have no idea from meeting Maggie that she's the powerhouse that she is," said Berkeley Councilmember Susan Wengraf. "She's had an extraordinary lifetime adventure." Where to begin? She worked as a shipyard welder and draftsman at the outset of World War II, learned to fly a plane when she was 18, earned degrees in physics and mathematics at UC Berkeley, lived four years in Europe and worked for nearly three decades as an accomplished physicist at Livermore Lab. And none of those is the reason for which she was chosen. Gee was honored this year by Congress and President Barack Obama as one of the groundbreaking members of the Women's Airforce Service Pilots, or WASPs, who served in World War II. Gee explained her unlikely participation — she was one of only two Chinese-Americans to qualify — as if it were a natural evolution, part of some grand scheme she envisioned years earlier. "When I was growing up," she said, "my heroes were Amelia Earhart and Charles Lindbergh. I loved to watch airplanes fly." The WASPs were recruiting there, and Gee recognized opportunity when it beckoned. "There were only about 1,100 of us chosen out of 25,000 who applied," she said. "It was an exceptional group of women. We all got the same training as the men." Even if some of the men were less than supportive. Gee's story is recounted in a children's book, "Sky High: The True Story of Maggie Gee," by Marissa Moss, recently published by Berkeley-based Tricycle Press. Moss said unearthing details of the obstacles Gee and other women fliers overcame was like pulling teeth. "Everything has to be drawn out of her," Moss said. "She's reluctant to talk about any negative experience — when she was growing up in Berkeley, she wasn't allowed to swim in the public pool because she was Chinese-American. I had to pry to get her to admit any of the discrimination she faced from male pilots." Gee still is hesitant to embellish. "Some of the men weren't sure we were ready for this," she said. "Women wouldn't put up with that now, but that was a different time." The WASPs flew domestic, noncombat assignments, often ferrying planes to destinations where they were needed, but that didn't make them immune to danger. Thirty-eight were killed in the line of duty. Gee primarily flew training planes, instructing male pilots in instrument flying and co-piloting a B-17 bomber in simulated dogfights. And then, almost as quickly as opportunity had arrived, it vanished. The WASPs were disbanded in 1944. Gee said she didn't fly again. With male pilots returning from the war, there were few job opportunities for women, but she has no regrets. "Flying was something I did," she said, "and then I moved on." Her focus today is political activism. Her passion is social progress. "She has a much deeper, broader life than what happened in the WASPs," Moss said. When the Berkeley City Council designated Aug. 30 as Maggie Gee Day, an eight-paragraph proclamation touched on her breadth of civic activities. Between the first "whereas" and the closing "therefore," Gee was applauded as "an icon of public service" for serving on the Alameda County Democratic Central Committee, the 1992 Democratic Party Platform Committee and the California State Democratic Executive Board. She was recognized as a past Berkeley Public Works Commissioner, housing advisory commissioner and board member of the Berkeley Community Fund. Wengraf presented the proclamation at Gee's 86th birthday party, along with a congratulatory note from House Speaker Nancy Pelosi and an American flag that had flown over the Capitol. "The party was astonishing," Moss said. "Everybody in Berkeley politics was there." Well, sure. How often do you get to share the company of someone in the same club as George Washington? Muriel Martin struggles these days to remember the years she spent as a World War II U.S. Army Air Force pilot. The dates have run together in her mind and the details of her training and experience long ago faded into the background of a life filled with child rearing and community service. But some days, the memories push through and she finds herself back in her 20s and in the cockpit again. Martin, now 87, blames her fading recollections on age and the full life she has led since leaving the service. For years, the group has fought for recognition of their contribution. Between 1941 and 1944, more than 1,000 women from across the country were trained as military pilots and dispatched to bases such as Mission’s Moore Air Field. They ferried weapons cross-country, delivered planes from manufacturing plants and towed targets during anti-aircraft gunnery practice, freeing up the men who traditionally held those jobs for combat on the European and Pacific fronts. All told, they piloted 78 different types of military aircraft and logged more than 60 million flight miles. But when the Army disbanded the corps in 1944, the women went back to their pre-war lives without any of the honors or benefits their male counterparts received. Just this year, President Barack Obama signed legislation awarding the WASPs the Congressional Gold Medal — one of the nation’s highest civilian honors. And for Dorothy Lucas — an 86-year-old former WASP at Moore Field who now resides in San Antonio — the tribute couldn’t have come soon enough. In August 1943, the Germans had just withdrawn from North Africa, U.S. Gen. George S. Patton had completed a successful invasion of Sicily, and Lucas was a 20-year-old secretary working at the Pentagon. A friend mentioned that the Army was recruiting female pilots for domestic training and Lucas knew she had stumbled on a way to satisfy her recently acquired flight bug. More than 25,000 women volunteered for the newly formed WASPs but fewer than 4 percent made the cut. Because the Army required each candidate to have logged several flight hours and to maintain an active pilot’s license, many of the young women that made it came from affluent backgrounds and families that could afford flight lessons. But upon arriving in the Abilene suburb of Sweetwater — where all the WASPs received their training — the women were introduced to others from around the country and a form of military discipline they had never encountered before Muriel Martin — then Muriel Kiester — had grown up on a sprawling patch of land in La Feria and had access to her family’s private aircraft. She learned to fly with her grandfather’s backing in 1944. 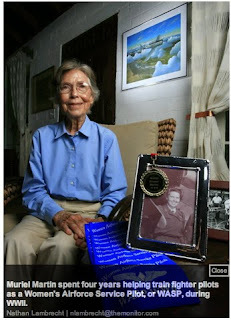 “We came from everything — schoolteachers, mothers, secretaries,” said former WASP Ann Hazzard. Hazzard, now 88 and co-owner of the Holiday Village Mobile Home & RV Park in Pharr, realized right from the start that her gender would be a constant issue during her time in the service — if not always a problem. When she arrived for her first Army physical in Fort Wayne, Ind., male soldiers weren’t quite sure what to do with a bunch of women in undergarments waiting for a doctor. Other members of the female corps were ordered to report their menstrual cycles to their training sergeants amid ill-founded fears that menstruation affected a woman’s stability and ability to pilot an aircraft. And while many former WASPs reported stories of strained relations with their male students and counterparts, most said that the men treated them with respect despite their gender difference. It was a distinction that Jacqueline Cochran — the most famous female pilot of her day and eventual leader of the WASPs — took pains to emphasize. When she pitched the idea for a women’s pilot corps to Gen. Henry “Hap” Arnold, chief of the Army Air Forces, she won one battle for women’s equality. But she emphasized among all of her fledgling pilots the importance of feminine dress and deportment while serving on a military base. 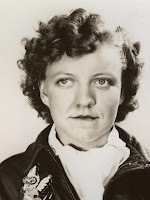 Cochran herself is said to have never left the cockpit of an airplane without reapplying her lipstick and fixing her hair. Lucas, the San Antonio WASP, said the emphasis on appearance definitely drew attention from the male pilots but also gave the women plenty of opportunity to surprise them — such as a flight she took from Mission to St. Louis with a male officer in 1943. The service did have its risks. Thirty-eight members of the corps lost their lives in the line of duty — some brought down by gunfire in training missions, others by faulty plane mechanics. Those deaths provided the women with their first glimpse at how the rest of the country viewed their efforts. Because they were members of a civilian auxiliary corps — and were not considered actual military service members — the bodies of those who died were sent home in plain pine boxes at their family’s expense. The next hurtful indication came in 1944 — when Congress decided to disband the group amid pressure from male pilots who had begun to return home in the final days of the war. All records of the WASPs were ordered classified and sealed for nearly 35 years. Many — like Lucas — went back to their former lives searching for something that would recapture their war-year adventures only to be squeezed back into their old jobs and routines that now seemed hopelessly dull. Others — like Hazzard — only got into a cockpit once or twice more before giving up flying for good. It was not until 1977 that President Jimmy Carter signed a bill recognizing their efforts and awarding the women status as veterans — which entitled them to health care benefits and GI Bill education opportunities. For Republican U.S. Sen. Kay Bailey Hutchison, that recognition came about 30 years too late for the women — many of whom were then in their 50s. She helped author the bill this year that awarded the women their congressional medals and is currently planning a ceremony to honor them in Washington, D.C. But as Martin stands in her La Feria bedroom a good 60 years after her first military flight, she says she has never felt much like a pioneer. Despite the pilot’s wings encased on her wall, the painting of the T-6D plane she used to fly and the medal she was given upon her induction to the Texas Aviation Hall of Fame, she has always looked on her wartime experience as just another adventure. Jeremy Roebuck covers courts and general assignments for The Monitor. You can reach him at (956) 683-4437. SANTA CRUZ -- Nearly 70 years after she flew with the Women Airforce Service Pilots during World War II, Violet Wierzbicki of Santa Cruz will get the Congressional Gold Medal, the highest honor Congress can bestow on a civilian, recognizing her service to the country. During World War II, female pilots including Wierzbicki enlisted in the WASP to fill the Air Force's need for pilots to carry out service missions so male pilots could fly in combat. The exclusive group of 1,102 women flew planes like the SBD, A-24 and P-47s and logged more than 60 million miles flying missions across the United States. Between 1942 and 1943, when she was 25, Wierzbicki towed targets behind her plane so fellow pilots could practice their sharpshooting skills. She was also responsible for ferrying planes from factories to Army Air Force bases and performing test flights. "I felt so proud to be a flying military aircraft and doing something for my country," said Wierzbicki, who expects to get her medal once it is minted. Wierzbicki, a native of Flint, Mich., took her first flight when she was 24 to overcome her fear of flying. She was hooked and earned her private pilot's license when she was 25. "I got curious and wanted to know what it would feel like to fly by the seat of my pants," Wierzbicki said. "So I took one lesson and then I wanted to continue, to solo and then got a private pilot's license." After returning home from war, Wierzbicki attempted to get a job as a pilot at a small commercial airline in Flint, but was told that she looked too young and people would not want to fly with her because she was a woman. She eventually worked as a secretary for GM and U.S. Steel. It wasn't until this year that Wierzbicki and her fellow pilots were formally honored for their service. On July 1, President Barack Obama signed a bill awarding all former WASP pilots or their surviving family members the medal to commemorate the women's daring and service. WASP pilots had never gained formal or public recognition for their service. "The Women Airforce Service Pilots of World War II were trailblazers and true patriots. They risked their lives in service to our nation, but for too long their contribution to the war effort has been undervalued or under-recognized," Sen. Barbara Mikulski of Maryland wrote in the bill she co-sponsored with all 16 other female members of the Senate. According to Mikulski, WASP pilots had no benefits and no insurance during their time spent flying. And the families of female pilots who died in flight had to pay to have the bodies of their loved ones shipped home. Though WASP members were promised military benefits when they were enlisted, they had to wait until 1977 for Congress to grant them. Wierzbicki and fellow WASP pilots will join the ranks of other Congressional Gold Medal winners such as Thomas Edison, Nelson Mandela and the Wright brothers. Today, former California Secretary of State Bruce McPherson will speak at a party at Dominican Oaks retirement home in Santa Cruz, where Wierzbicki lives, to celebrate her military flying career. She and fellow pilots will be invited to Washington, D.C., for a formal presentation of the medals once its design has been finalized and cast. After the presentation, the original medal will be displayed at the Smithsonian Institute. Wierzbicki hopes to fly to Washington, D.C., for the presentation. "It's a great honor to all of us," Wierzbicki said.